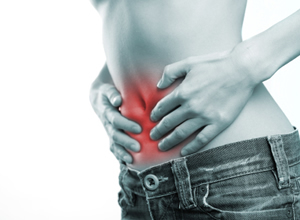 Severe menstrual cramps can happen through perimenopause as well as in younger women. Now research shows your brain, as well as your body, can be affected. Researchers from the National Yang-Ming University in Taipei, Taiwan, published an online study in the journal Pain. This is a very small scale study, only 64 participants altogether, but it could prove significant in helping treating period pain. Anyone suffering from pain anywhere in their body knows that the effects are far reaching and previous research has shown that chronic pain can produce changes throughout the entire nervous system. However, this is a first in that no one has looked at whether the type of pain experienced by many women as part of their monthly cycle can also produce such changes. At perimenopause in particular periods become erratic, and can be accompanied by very heavy bleeding if endometriosis related to oestrogen dominance is present or fibroids. This study was done using magnetic resonance imaging (MRI) brain scans on 32 women who reported experiencing severe menstrual pain and 32 women who did not suffer in the same way. The scans were conducted during the period surrounding ovulation (the periovulatory period), during which there is no pain. No differences were seen between the two groups in overall nerve cell mass in the brain but the researchers did observe differences in specific regions of the brain. The changes were most striking in the hypothalamus, which is known to play a critical role in regulating the menstrual cycle. Changes were also seen in areas of the brain that regulate pain transmission, pain modulation, higher sensory processing, endocrine function and emotion. It seems fairly conclusive to me, but the researchers are more cautious stating that the pain may not be directly responsible for the changes observed in the brain. Other menstruation-related factors, such as hormones and changes in blood flow or spine/synapse density, might ultimately be responsible for the changes. Hormone imbalance is often behind period pains and cramping so make sure your levels of progesterone are adequate. Many women who have regular periods up to menopause may not be ovulating, and therefore not producing progesterone. This makes them more vulnerable to the symptoms of oestrogen dominance, particularly going into perimenopause. The old-fashioned, but effective, method of a hot water bottle held against the stomach is cheap and instant and for pain relief and the new microwaveable ones are a bit safer. If you don’t want to take painkillers then you could try white willow bark tablets (the precursor to aspirin) or Pycnogenol, the French maritime pine bark extract, which in a trial in Japan was found to be helpful. Vitamin E has also been tested and found effective in some women, but it does need to be taken continuously and may take some time to kick in. Ginger root steeped in hot water and drunk once or twice daily with a teaspoon of honey can help reduce the pain and drinking camomile tea will help relax you, which can also ease pain from muscle tension. Lavender oil will help relieve tension and soothe pain, particularly in a warm bath before bed.